10 Competitive Eating Challenges at Restaurants in the U.S. It's an old schtick. Many restaurants around the country offer large specialty dishes with a challenge: If you finish the meal, you win a reward—a free meal or a prize, and sometimes both. The high prices of these extra-large meals are usually in line with the amount of food you get, so even if you can't finish it, you'll have leftovers to take home—that is, if you don't become sick from the attempt. Here's a sampling of the challenges that await your appetite. The cuisine may vary, but the rules are generally the same: clean your plate, stay under the time limit, and no vomiting (intentional or otherwise). Loopy's II Bar & Grill in Marinette, Wisconsin, offers the Cardiac Arrest burger for $35. It contains three pounds of ground beef, a pound of ham, a pound of bacon, and a half-pound of cheese topped with onions and barbecue sauce. If you finish one in an hour, you'll get a free T-shirt. Beat the record, and the food is free. If that's too much, you might want to try the Belly Buster—a two-pound burger with a pound of fries. You get 15 minutes to polish that off to win a T-shirt. The Seiad Cafe in Seiad Valley, California, makes large pancakes—13 inches in diameter and 1.25 inches thick. Finishing one pancake that size would be difficult for most of us, but if you take the Pancake Challenge, you'll be served five, with butter and syrup. If you can eat them all in less than two hours, your meal is free. Otherwise, it will cost you $13.95. Dobbs Dawg House in Dobbs Ferry, New York, will put nearly anything on a hot dog. There are dozens of toppings, or you can order a dog from their specialty menu, like the Trailer Park (melted cheese and crushed potato chips) or the Hawaiian Dog (bacon, teriyaki sauce, pineapple, and scallions). The Dawg House Challenge dares you to eat a dozen of those specialty hot dogs—but you can't select them. A roll of dice determines which hot dogs you get. If you finish all 12, in menu order, within 30 minutes … well, the website doesn't really promise a reward. Bragging rights? Acme Oyster House in New Orleans' French Quarter (and five other locations) features the 15 Dozen Club—those who have eaten 15 dozen oysters in under an hour. There are a lot more of them than you'd think. There are rules, and the rewards are half off the price of the oysters, a T-shirt, and your name in the restaurant's hall of fame. So Ba Vietnamese Restaurant in Atlanta has the Pho King Challenge. 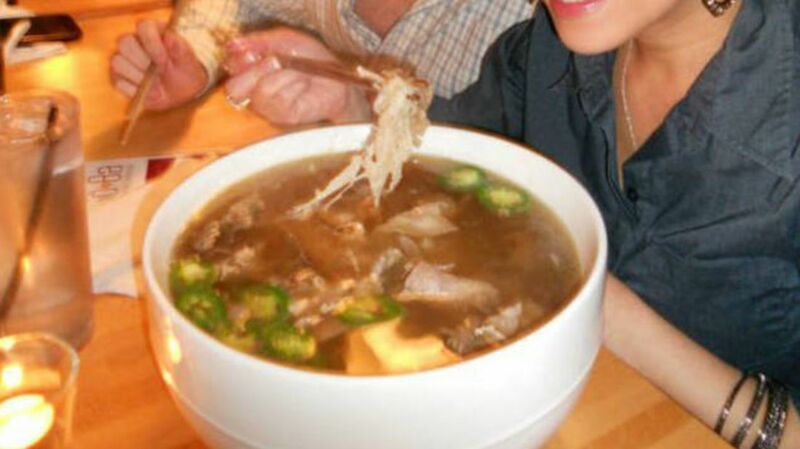 You pay $25 for a huge serving of pho consisting of 20 ounces of meat and 96 ounces of soup. If you finish it within an hour, it's free—plus you get a T-shirt and a gift card. However, only one person has actually done it so far. Still, that's still a lot of pho for the price, and even losers get a T-shirt. Not all food challenges are meat-based, or even entrees. It’s All So Yummy Cafe in Knoxville, Tennessee, makes their own ice cream on site. How much of it could you eat in one sitting? The Rocky Top Challenge is an ice cream sundae consisting of 16 scoops of ice cream, three brownies, three bananas, and a bunch of toppings. If you can finish it by yourself in an hour, it's free. Otherwise, it's $50. Joe Taco Mexi-Cafe in Amarillo, Texas, offers the Chupacabra Challenge, an eight-pound, two-foot-long burrito with the works for $24.99. If you eat it all, by yourself, you not only get it free, but you also win a T-shirt, a place on the wall of fame, and a free meal every week for life. Black Mountain Mill and Pizzeria in Black Mountain, North Carolina, has an enormous pizza oven. Its famous $150, 40-inch pizza can feed 20–25 people. The pie can be delivered, or you can reserve the restaurant for a party with one pizza for all your friends. The 40-inch Pizza Challenge is one you don't have to do alone: Two people get an hour to polish off a two-topping monster pie, without leaving the table. (A common rule—no bathroom visits to "make room.") If you succeed, your duo wins $1000. Cubavana Cuban Restaurant and Cafe in Cutler Bay, Florida (South Miami), offers the Cuban Monster Challenge. Order a 35-inch Cuban Monster Sandwich for $35. If you can finish it in 45 minutes, you'll receive $25 cash, a free meal, and a T-shirt. The restaurant will also donate $40 to the Juvenile Diabetes Research Foundation in your name. If you don't finish it, you'll have delicious Cuban sandwich leftovers for the next few meals. Stuffy's II Restaurant in Longview, Washington, serves a full menu, but it's their enormous cinnamon rolls that made them famous. They have a quartet of food challenges: the Party Burger with five pounds of meat; the Almost a Dozen Egg Omelet; the Bear Roll (a 10.5-pound cinnamon roll, scarfed down in the above video), or seven pounds of whatever food you want. Prices, rules, and prizes vary.